Frostflare walked out of her cave, closer to sol so when her eggs hatched she could get some mother tips. "What sol? Have something planned because these eggs are taking forever to hatch! I am ready to strech out my wings and do something." She told the dragoness hopeing that they would go out. The icy blue dragoness smiled warmly at Frostflare. "Hello! And Frost, you should only leave your nest if someone's watching them or if your mate is there." She suggested, sitting down. "And would you like me to teach you a bit about mothering? And speaking of planned things, I was hoping I could take some of you guys out to hunt." Frostflare excitedly spoke to her fellow Icewing. "Really? Awesome, also don't worry. I have Sorin on the job. So who else are you going to get?" Her head tilted slightly to the right. "I was hoping we could grab Snowfall or someone?" She asked curiously. Frostflare replied. "Ok, lets go then. What are we waiting for?" 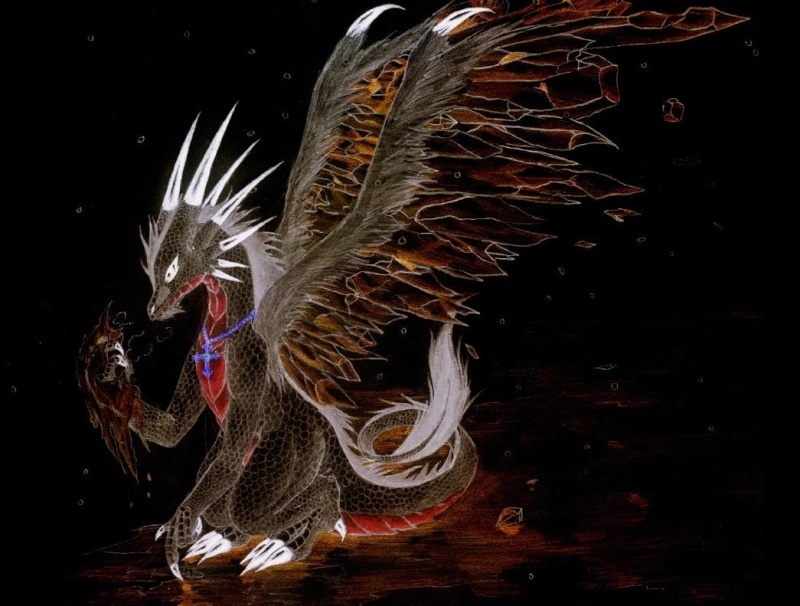 She lumped up into the air and took flight fowards then turned around to face the other dragon. "Are you coming?" she asked. Solstice smiled and took off after her, slowing down to a cruise speed as she scanned thr ground for prey. Frostflare followed arfter her. She looked down at the ground, hoping to find a herd of elk, or at least something. She was quite hungery and didn't eat yet. Solstice darted down as she noticed a family of four deer eating by a tree, just outside their territory. She zoomed and quickly killed the beefiest one, looking at Frost. Frostflare quicly dove another direction. Though it might have been early to dive, she had spotted a buck on the side of the mountian. Wating no time she picked it up with her claws as it tried to struglle free. She then got closer to the ground and dropped it on purpose to kill it. She picked it up and looked at Sol. "So you got something too." she announced. Solstice nodded and ran after a deer who had attempted to escape after the male was killed. She picked it up in her maw, biting it ever so perfectly that it died. She carried both catches to Frost. Frostflare dropped her prey down. "This is my breakfast, I think we should eat." She told sol right before eating. Solstice nodded and grabbed a deer, chewing on it. She swallowed: "Oh, and when your eggs hatch, make sure that they get plenty of food." She said... "They're always so hyper and need supplement." The dragoness explained. "Ok, thanks!" Frostflare told sol in between a bite. "Speaking of, how are you little dragons doing?" She asked her. Solstice took a bite and swallowed to answer. "They're great! We taught them how to hunt and such awhile ago.. I think they're going to make amazing dragons." "Awesome. After we finish eating we should go on the move again before our scents drift off and scare away the prey." Frostflare said. "Yeah. Sure." Solstice said and nodded, eating her share of the prey as qucikly as possible. Frostflare finished her prey and then stood up. "Are you ready to go?" She asked sol. The feathered dragoness stood up as she finished her share, looking at Frost. "As always." She said warmly, smiling and treading through the snow to search for any scents or prey dens. Frostflare put her maw in the snow, trying to find a scent that she could follow. Solstice stopped as she heard rustling underground. Rabbits! She looked for an entrance and shoved her paw down the nest, grabbing a rabbit in her claws and killing it. It was a rather large one, too. Snow had her day off from leader duties, along with her friend, Frostflare. She was tired. All those duties had kept her away from all her friends. SnowFall decided to go outside the palace and hunt. It had been a while since she had played with her tracker skills. The leader took off gracefully and flew in the white sky. As she landed she spotted some rabbits. There were a lot of rabbit holes where she was at. Quickly, she grabbed a prey and quickly killing it. After she ate her fill, Snow scented another IceWing in the air. She got up and walked around and noticed Frost and Sol. She quickly went up to them, "Hey guys! You peeps hunting too? I just ate, but it's nice to see ya guys again!" She grinned and went over to Frost, "I'm assuming you finished the leaders duties early? Lucky.. It takes me a while to finish them! But it's nice to be together again!" Snow sat down next to Frost and Sol, waiting for them to respond. Glacier was flying back to the IceWings territories after one of his solitary travels. He knew to have spent too much time outside and the others were probably worried for him. Glacier flew over the snow mountains, exploring the area to find the other IceWings. After a while he finally spotted a group of ice dragons that were hunting. Glacier released a little roar to advise the others about his presence. Than he gracefully landed down on the snow, walking towards the others with a calm step. "Hello. I'm back." He smiled at them, but he was a bit in discomfort to stay between other females. Glacier was currently the only male IceWing around, so females would start to look at him as a potential mate. However he knew that one day he would find a mate. Some of the IceWings females were beatiful and with interesting personalities, like SnowFall, that was also a tribe leader. Frostflare greeted the other leader. "Honestly it's the eggs that are more challenging. Leader duties for me is quiet a breeze. Anyways I think it would be cool to have a hunt together." She told her with a voice of joy. Then Glacier showed up. "I have been wondering where you went! Where were you? Why didn't you tell us? OH, I am glad you made it back in time for the hunt!" Frostflare cheered. She then herd what sounded like an Ox. She quickly located it then froze it with her ice breath, after that shattering the ice. She bit the back of its neck to make sure it was dead. Frostflare annouced to the others. "Well, I got some more food, quiet wooly if you ask me!" SnowFall nodded at the words of Frostflare, "Seems like your having fun with the eggs," she laughed. "Well, I'm just glad your here to hunt with me." At the end of her sentence, Glacier, a male IceWing, arrived. Snow blushed. She sorta had a crush on him. But she left that emotion behind. The leader was glad to have a lot of dragons here to hunt. "Hi Glacier, good to have you here." Snow hoped that he wouldn't notice the faint rose color on her face. After all, her body was all white. After Frostflare hunted Snow asked Glacier, "Have you hunted yet?"